Step 4 of the Holt Proposal sent me tracking down minority populations. The city of Allentown in Lehigh County came up as one place that needed attention. When creating a district that kept political subdivisions whole, the minority population in Allentown was left with no district. This meant that the Voting Rights Act caused one of those “absolutely necessary” situations referred to in the PA Constitution. It required we make some splits in Allentown. Let’s start with some before pictures for context. The above map just shows Allentown. 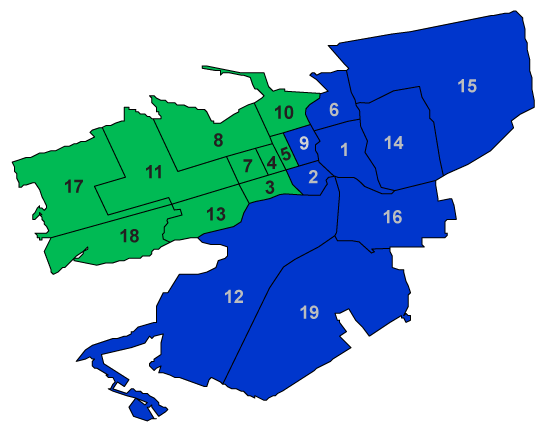 The blue portion is one district and and also included part of Salisbury (Ward 4 & 5, not shown). 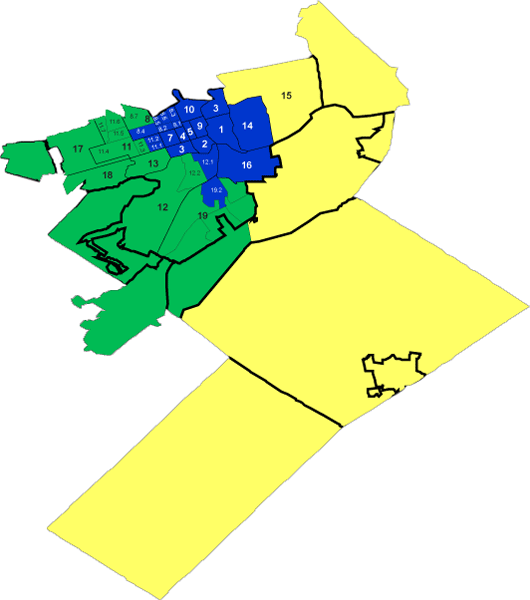 The green portion was the rest of Allentown. Checking the racial stats for over 18 population, one was 32.9% and the other was 35.9% for a total of 68.8%. A percentage like this indicates that a minority-majority district is possible with some adjustments. So adjust we did, as shown in the next map. This region includes not only Allentown but some of the neighboring townships. The minority-majority district is colored blue. As you can see, Allentown had to be split three ways in the shift. Testimony was presented at the Allentown Public Hearing that requested the East portion of the city (Wards 14 & 15) be kept united as a community of interest. A second adjustment of the map was made to try and address this concern while still retaining the minority-majority district. 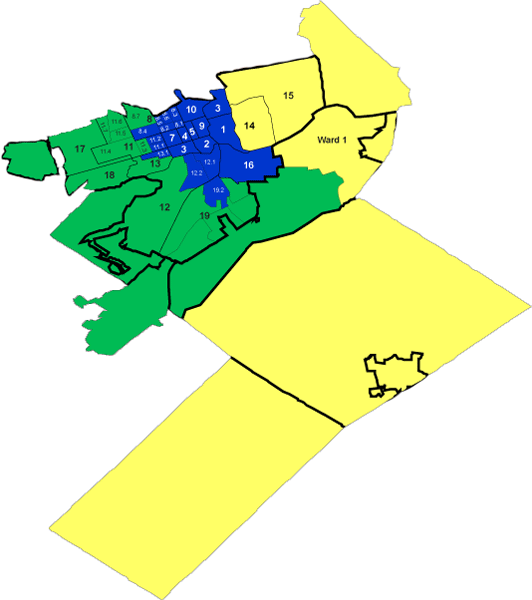 A final alternative emerged for the Allentown area that only split Allentown into two districts, instead of three. The minority-majority district does just fall short of the 50% + 1 rule (it is at 49.5%). Here are the district sizes and specs for each. 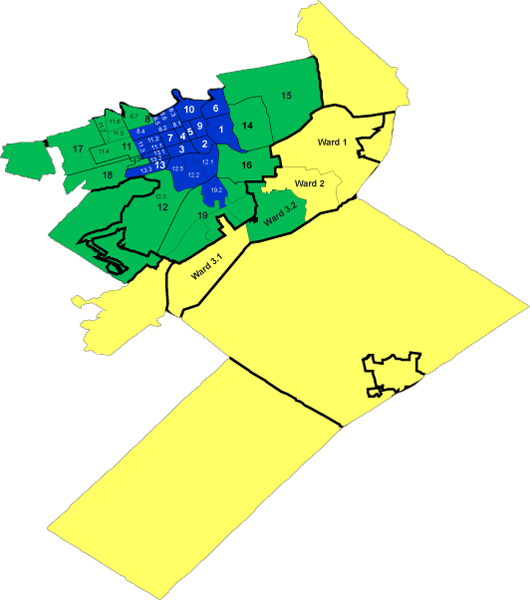 Blue (62,264): Allentown (Part – Ward 1, 2, 3, 4, 5, 6, 7, 8 [except 8.7], 9, 10, 11.1 to 11.3, 12 [except 12.3], 13 [except 13.4]. The racial stats are 55.6% Hispanic (49.5% of over 18 population). The population is more equal with Version 3 and seems to do the best job balancing the rules of keeping political subdivisions whole and racial districts. What do you think? Does one version follow the rules better than another? Which is your favorite? Previous article2000 Redistricting: Were Maps That Bad? That’s some changes alright! But your diagram made understanding them much easier. Thank you.